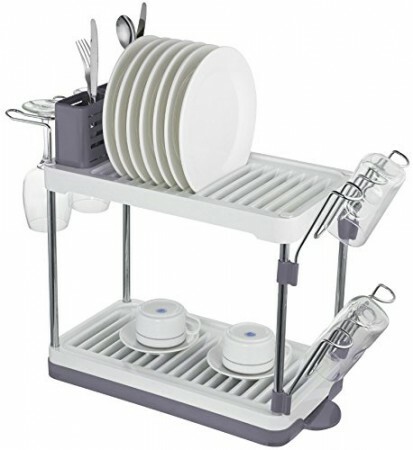 Two tier dish drain rack supports more space for dishes, plates, cups, bowls, flatware and kitchen utensil. Surpahs 100% satisfaction guaranteed, 100% worry-free guaranteed. Two tier dish stand drain rack for kitchen utensil and tableware. - Fits up to 32 pieces 12 inches full size plates. - Simple, Contemporary design for any kitchen. Spec: 15.7 inch to 21.3 inch long; 8.3 inch wide; 16.5 inch tall. Please refer to the 4th picture for detail measurement spec.